Dr. Lennox Pike, Honorary Consul in Michigan,Consortium Patron and Members of the Consortium for Belizean Dev. Inc. THEY came, they spoke and they listened!! 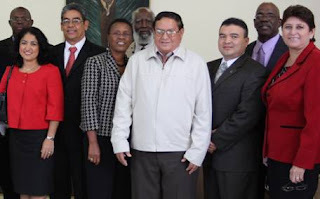 ( Los Angeles ) It was not until he saw Deputy Prime Minister and Minister of Natural Resources and the Environment, the Honorable Gasper Vega and his wife Marilyn, who were joined by the Attorney General and Minister of Foreign Affairs and Foreign Trade, the Honorable Wilfred Elrington and his wife Barbara that the Consul General of Belize, Honorable Roland Yorke was finally convinced that the delegation of elected officials from Belize was finally at Los Angeles International Airport. "The Belizean community will finally be able to engage representatives of the fourteen months old government in several meaningful conversations over the next two days," stated the Consul General as he joined Belize 's Ambassador to the United States , His Excellency Nestor Mendez. Together, they greeted the remaining members of the delegation consisting of the Honorable Peter Eden Martinez , Minister of Human Development and Social Transformation, Mayor Elsa Paz, Mayor of the Town of San Pedro and her assistant, Jose Felix Ayuso. The Honorable Rene Montero, Minister of Agriculture and Fisheries arrived later that night from Washington D.C. , just having attended a conference in the capital. The Consulate of Belize hosted a breakfast at Christ the Good Shepherd Church conference hall on the morning of the 25th. 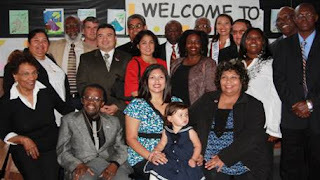 The visiting delegation met with Belizean organizations and individuals in the Los Angeles area. Members of the delegation made brief remarks with the Deputy Prime Minister and the Foreign Minister both touching on the current administration's desire for transparency and public consultation in governing Belize . The relationship between the government and Belizeans living abroad was driven home by Foreign Minister Elrington. "The present government acknowledges the vital role played by Belizeans living abroad to the current and future development of Belize ,” he stated. Later that afternoon, members of the delegation attended constituent divisional receptions where they were able to engage in brief one-on-one conversations. The 4:00 pm Open Door Reception allowed for the public at large to interact with the delegation without the requirement of a special invitation. It created the environment for Belizeans to introduce their family and friends and to engage in picture taking. Following the introduction of the delegation, Deputy Prime Minister Vega once again touched on the theme of the visit; "we want to be sure that we have a sense of your concerns and therefore we are here, not only to tell you what we are doing, but to listen to what you have to say." It was more than three hundred Belizeans who gathered in the auditorium of the Holy Name of Jesus School, an institution with a significant Belizean staff and students, to actively participate in the Town Hall Meeting, the last event of the visit. Once again, following opening remarks by delegation members, questions were raised from the floor centering on issues such as the status of the Belize/Guatemala Dispute as it relates to the International Court of Justice (ICJ), Land Ownership, Investment Opportunities, Rising Crime Rate, Punishment and the Death Penalty. A few questions dealt with Personal Responsibility and other Social Issues currently facing Belize . 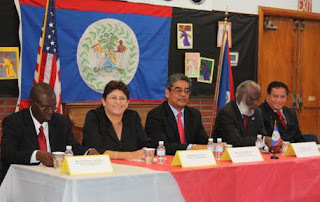 As a follow-up to the delegation visit, Consul General Yorke spoke of the intent of the Consulate to have both Beltrade, the department responsible for investment in Belize , and the Department of Agriculture, whose responsibilities also include the coordination of Cooperatives, visit the Los Angeles community and coordinate workshops on both subjects. He brought the meeting to an end by thanking all those who volunteered both in cash and in kind to make the visit possible. Although she did not get to ask her question, a smiling middle age woman in a conversation at the conclusion of the program, while apparently awaiting a ride quietly said," the information they shared with us now makes it possible for us to understand what is taking place in Belize . I just hope they understood what we said," she concluded. By 10:30 p.m. those members of the delegation returning to Belize appeared somewhat exhausted but appreciative of having visited with the community.